Film Focus is an ongoing series of writings on modern films that stray outside the mainstream in their scope, style, and substance. Works that transcend genre and will hopefully become canon films of contemporary classics. It also encompasses film works of the last century who have influenced todays modern masters but perhaps have not been seen by a wider audience today. To kick off FILM FOCUS I decided to pick a very contemporary film that also has its roots in my early childhood-and the childhood of millions, with Maurice Sendak's controversial and beloved picture-book Where The Wild Things Are and it's contentious adaptation from ADAPTATION's visionary director Spike Jonez. So after the jump checkout FILM FOCUS' first article "Where Wild Things Fear To Tread: Adapting a beloved (but brief) classic into a new original work of art" by yours truly. Since the dawn of cinema (a brief 150 years ago) film makers and writers have been joined in a struggle to bring content to the screen. One long mined source is of course, literary adaptation. Some of the earliest films were cinematic adaptation of Shakespeare’s plays an attempt to lend the theatrical and literary weight of the Bard to the “vulgar” medium of cinema, then (and frequently still) not considered an art form. The art of adapting an existing work of art from one medium to another is not new. Appropriation and working from references is as old as cave paintings, it is a part of the sociolinguistics of story telling. Adapting a work of non-fiction is a difficult task; streamlining historical events and lifetimes, compressing history into a tidy two-hour light show on a screen. Fiction can be trickier, as there is often not a contextual historical reference point, no collective subconscious to fill in the gaps. Also there is the dreaded fan base. When adapting a work of fiction you can never make everyone happy. You must pick and choose the cinematic elements of a work and try to order them into an acceptable screenplay that flows and tells a somewhat cohesive story. This always angers those most familiar with the source material. Leaving out beloved details, trimming secondary characters to stream line events, sometimes changing the setting or tweaking the costuming, always, are controversial changes that must be justified in the writer’s vision. If leaving things out for brevity is a tightrope act, what of adding additional material? Tinkering with a work, adding characters and events to flesh things out and create exposition is nothing new, but always a cautious endeavor. Short stories have made a plethora of feature films, some with multiple adaptations. Now imagine taking a beloved classic, read and obsessed over for generations by children and adults. The challenge is daunting, no? The details in classic film adaptation of The Wizard of Oz (1939) are actually more widely known now than the L. Frank Baum novel from 1900. The film (already adapted multiple times) departs significantly, sorry folks, those ruby slippers worn by Dorothy Gale (as portrayed by a drugged up teenage Judy Garland in the film) were magical all right, but silver in the book. Maurice Sendak’s 1963 picture book Where The Wild Things Are is then a case study in the necessity to sometimes add to a story, and how to find a balance with the themes and feel of the source material. The controversial book has been a staple as both the most beloved and popular book in libraries for generations of youngsters and also one of the most consistently banned books in the United States of America. This seems like a Hollywood hot property- so why did it take editor/novelist/first-time screenwriter Dave Eggers (founder of McSweeney’s, A Heart Breaking Work Of Staggering Genius) and visionary writer-director Spike Jonez (Being John Malcovich, Adaptation) so long to adapt this wonderful work? You see the book is brief . Very Brief. Nine Sentences. Three hundred and thirty eight words all together. Part of the challenge was channeling the theme of the book: How a child masters various feelings as they grow, how they confront fear, anger, rejection, fury, and the isolation of the imagination. Adapting Where the Wild Things Are would prove a pretty heady challenge indeed. 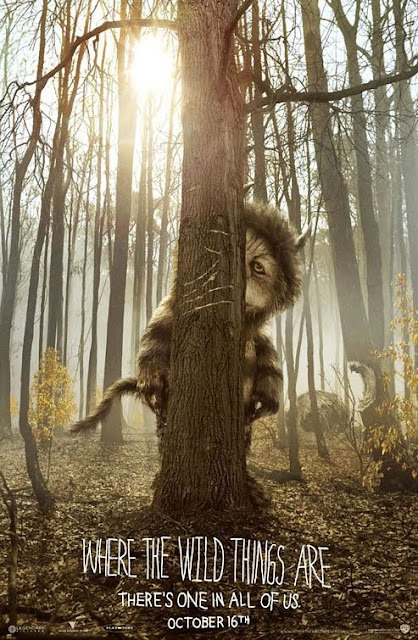 Already adapted, as an award winning cartoon special by Scholastic, and in 1984 by Sendak himself with Oliver Knussen as an opera, a live action film seemed a highly unlikely endeavor. Disney/Pixar famously began conceptual work on an early CGI/hand drawn animation version but abandoned it; it resurfaced in a retrospective of Pixar’s ground breaking animated short films. Jonez and Eggers gently expand the narrative, casting light around the shadows while making sure not to tamper too much with the ambiguities of the story. The screenplay is a dense read filled with descriptions of landscapes and face changes, full of feeling. This was Dave Eggers first screenplay, but due to numerous delays the final resulting film was released the same year, 2009, as his second screenplay, and original Away We Go he co-authored with his wife Vendela Vida and was directed by Oscar ™ winner Sam Mendes (American Beauty, Jarhead, Revolutionary Road). It has the heavy feel of literature more than the usual screenplay, full of descriptive moods and atmospheres, and expositional narrative. A sister barely mentioned in Sendak’s sparse prose is fleshed out in the screenplay, here called Claire a teenager simply growing up, her need to pull away from the family nest is an act of betrayal to the eyes of our protagonist nine year old Max (played with startling pathos by new comer Max Records). The mother who sends a rambunctious Max to his bedroom without dinner is given very real depth and despair by Catherine Keener’s portrayal as well as the scripts pathos. Grounding the real world sets up the very “real” imagination we visit later in the script. When we meet the “Wild Things” on Max’s mythical voyage, they are wild in the sense not that they lack domesticity but that they are feeling itself. Unbridled and unchecked. 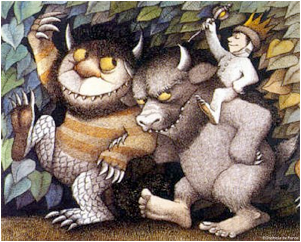 Sendak has long admitted he based the creatures in the book on various relatives and how he remembers their interactions from a child’s perspective. This carries over well into Eggers and Jonez’ script which finds the Wild Things to be very human indeed. Petty, squabbling, romantically entangled, susceptible to bouts of rapturous joy one moment, and crushing despair the next, fury always beneath the surface. Just like childhood. Fig 2. Carol (v. James Gandolfini) and Max (Max Records) find kindred spirits in each other. During the scene we see Max in bed trailing a tiny toy boat over his sheets like the sea, later to be revisited by Max’s “actual” sea going voyage to the island nation of the Wild Things. The scene reads like so many real moments- we hear off screen Max’s mother and his sister, the aforementioned Claire argue about their mother’s missing some unknown school activity, Claire criticizing her mother’s job and her mother for not quitting or demanding a raise. Their mother pleading with Claire not to tell her father that she “has enough voices in the house and the one I don’t need to hear is his” It leads us to an anxiety riddled grade school lecture on the death of the sun, then to an at home date night and dinner melt down by Max when confronted with his mother’s new love interest (a brief onscreen cameo by Mark Ruffalo) and the prospect of eating frozen corn in a dish instead of fresh corn. Both are of equal urgency and disdain in Eggers and Jonez script. Childhood is so rarely black and white, and if it is it only lasts for a passing moment. This summarizes the writers aspirations, a reminder to parents the mind of a child is not filled always with superfluous thoughts; that inside this turbulent world is angst and unease and questions. An anxiety arrived at out the world in which they live, as well as the ones they imagine. Is the job of a parent then, to keep the sadness away? 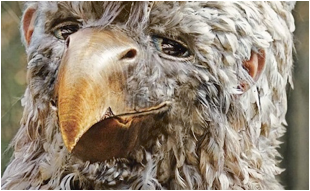 Perhaps it is better to observe as we are shown by the work of Sendak, Jonez and Eggers, that sometimes the sadness comes, we rage against it, and that is the best we can do, after all there is a wild one in each of us. No distinct date can be agreed upon, as William Lincoln’s 1867 Zoopraxiscope was a stationary installation device that allowed viewers to see “moving pictures” similar to simple animations. The Lumière Brothers are often credited as inventing the motion picture camera in 1895 but the Thomas Edison estate argues he invented it in 1891 with the Kinetoscope and in 1896 with the Vitascope. However Edison was successfully sued on numerous occasions of fraud, thief, poaching, and infringement of copyright and patent. The Wizard of Oz was adapted first as a stage play in 1902, then as a silent film in 1910, 1914,1921,1925 and 1932 before becoming the famed 1939 Technicolor musical film adaptation directed by Victor Fleming. Subsequent feature film adaptations have followed in 1969, 1971, 1974, 1985, 2005 and an upcoming 3D CGI film in 2011 directed by John Boorman. 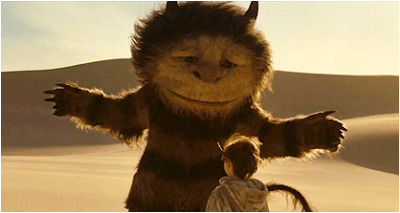 Dave Eggers would turn the screenplay into his 2009 novel Wild Things, making his novel a more post-modern as an adaptation of the screenplay for the film adaptation of the book Where The Wild Things Are. Incidental foot note- this author was once a very young, very disgruntled intern for the artist Andy Goldsworthy for a short period in the late 1990s. Chris Cooper starred in Jonez last feature film Adaptation (itself an adaptation-of sorts-of Susan Orlean’s nonfiction book the Orchid Thief) in 2002, for which he won the Academy Award™ for best supporting Actor. The final scene finds Max returned home his mother serves him a bowl of soup and watches him as he eats silently at the table content that they are both safe at home again. This is Max’s final parting exchange between himself and Carol, both heartbreaking and jubilant.